FORESTERS CENTENARY was built by Groves and Gutteridge at Cowes in 1935, costing £3,569. She was named by the Admiral of the Fleet, Sir Roger Keyes, on 18 July 1936 and was a gift from the Ancient Order of Foresters to the RNLI. 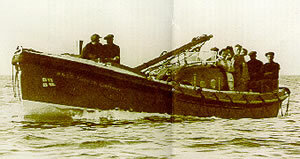 She served at Sheringham, Norfolk from 1936 to 1961 and was Sheringham's first motorised lifeboat. She became known as the 'airmen's lifeboat' because she rescued more RAF personnel than any other lifeboat. She stood by for hours during over 1000 bombing raids and is credited with being launched 129 times and saving 92 lives. FORESTERS CENTENARY was sold in 1961 into private ownership. She had a cabin and wheelhouse fitted at this time and was converted to a fishing hire boat. She was renamed SEAL MORNING and kept this name until 1998. In January 2003, she was put on display at Sheringham.